If you ever wanted to know, why this problem has not been solved by professionals yet, you can find the answer in this book. In this chapter, we explain the professionally confirmed sequence with the strongest moves for both sides. White wins by two points !!! In this chapter, we present in chronological order the main results, and findings. This chapter explains, in detail, the move (an Oki), which lead to the refutation of the known (professional) solutions. In this chapter, we examine various aspects of the Oki, which we think could have been responsible for the effect that the professionals did not use it in the decisive moment. This chapter explains the consequences of the move (a Guzumi), overlooked by professionals, which we think gives the victory back to Black. In this chapter, we consider some earlier commentaries concerning the Seki in the lower right corner. In this chapter, we explain the main variations after the Guzumi in the upper right corner. Our solution ends with three points for Black. This chapter explains an effect, which is important in conjunction with the Guzumi. This chapter explains the problem's element in the lower right corner. We wrote this synopsis primarily to give an outline of our solution, but also to highlight some of the problem's main features and interdependencies, in an attempt to clarify the structure. After the book was in final proofs, we heard about a recently published book, "Research on Weiqi Fayanglun", by Cheng Xiaoliu 6p. 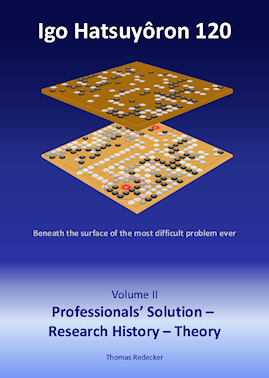 This is an updated and extended edition of his 1988 book "Weiqi Fayanglun New solutions". It was too late to integrate his findings, concerning problem 120, in our book, so we give a brief overview about his results here. Some more of our findings (but not all !!!) can be called "professionally validated" now. Is it available in any e-format? Best would be Smartgo but PDF or any other non interactive format would be good enough too. Gunnar Dickfeld from Brett-und-Stein publishing house is in talks with Anders Kierulf to get an idea about time, effort, and conditions, to have some of his books published as e-book. But I fear that this will become a long-term project. The commented SGF-file presents our knowledge as of mid 2008, but should be more than sufficient to understand the problem, especially the Main Path and its variations. Further information will be gladly given here. Or via the email-address that is given in the file. -- Anders Kierulf from SmartGo Books. Unfortunately, it will take some time until the publication. -- David has several other books to come in his publishing pipeline already, so the "Elephant" must queue up. -- Transformation into the SmartGo Books format will also last a while. So far, some teachers, and players up to 6d, liked the idea that is behind the pedagogical concept of the book. Wow, it is really cool that Igo Hatsuyoron has been published in English. I wonder how many English speaking players are really strong enough for this book though. This is about just one problem from igo hatsuyoron. So far the only book for more problems is a fairly old one from Yutopian. The "Elephant" is an introductory book to the problem, so most of the problems are not so very high level. Quite the contrary, there is the risk that some readers might find some easier problems somewhat boring. As boring as checking the 100 blue puzzle pieces for creating the sky one by one, but from which each single one is necessary. And in the end they will enjoy the whole picture. Cho HyeYeon 9p will publish an English translation of the entire Igo Hatsuyôron in her "Baduk Classic" series some when in the future. 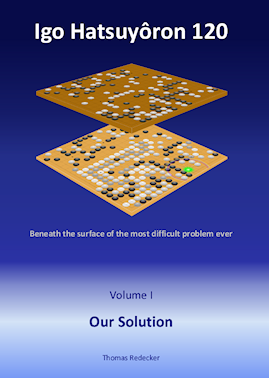 Our publications are only about problem 120, the most difficult problem ever created. We will be pleased to respond to suggestions, questions, and comments, here in this thread. I earn nothing with the books, so hopefully this post is not contrary to the forum rules. Also, I’d actually wish that people who write good Go literature earn good money by selling their books! Books may be announced in the Go Books forum. What are the differences to the previous print version? Books may be announced in the Go Books forum. These can be understood as a supplement to the website. It's not the other way round. What are the differences to the previous print version? Which edition of our books do you mean ? There is only a publicly available printed edition, from Brett-und-Stein-Verlag, as of 2011. Yes, this is the latest printed edition I have.